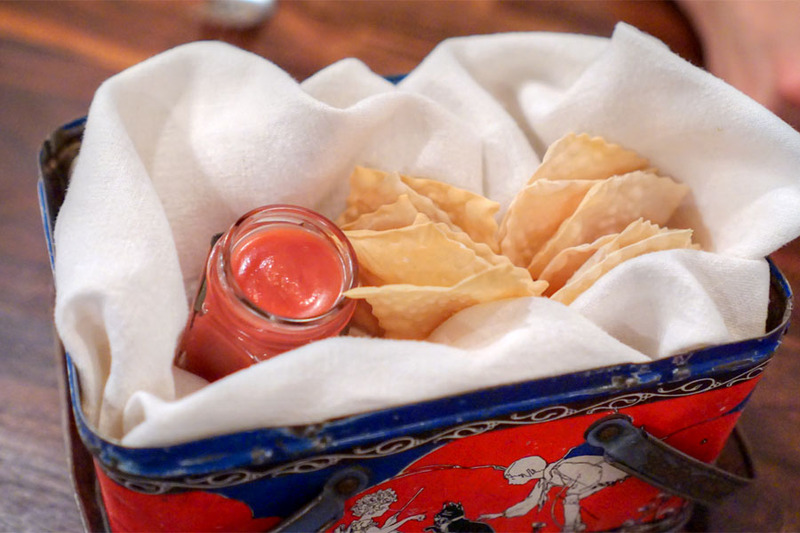 My most recent meal at Maude featured a star ingredient that, as regular readers will know, I have a bit of a dubious relationship with. Beets are known for their earthy, sugary qualities...qualities that don't usually sit well with me. However, given the strength of my previous meals here, I was hopeful that the kitchen could work its magic with the root vegetable. 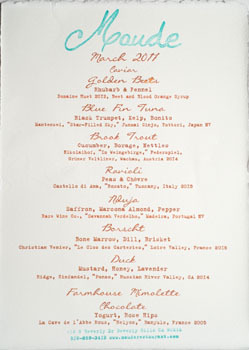 Above we see the evening's 10-course beet menu. The cost has remained at $125 a head, plus $95 for the standard wine pairing (which we opted for) or $125 for the upgraded one. Click for a larger version. First up was an amuse bouche course, one featuring horseradish ice cream topped with caviar and wrapped in beet "leather." It was a promising start, as I enjoyed how the sweetness of the beet shined in neutralizing the saltiness present. Neat. Here, golden beets were combined with rhubarb and fennel. The result was a mix of tart, pickley, savory flavors offset by the anise-y nature of the fennel. Texturally I found this interesting as well, as the dish had a "sticky" sort of consistency that actually made me think of Fruit Roll-Ups. Smeared on the plate were a bluefin tartar, roasted kelp-wrapped beets, black trumpet mushrooms, and a dollop of bonito cream. This was a standout course for me. 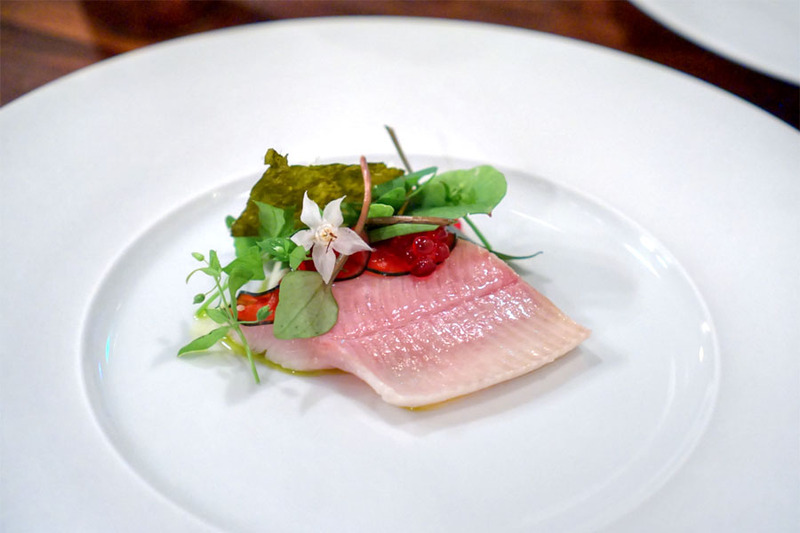 The fish conveyed a deeply intense brine, one that was seemingly amplified by the mushrooms, umami-laced beet, and smoky, ocean-y bonito. The four elements really worked together beautifully, and never did the flavors become overwhelming. Also intriguing was the paired sake, which had a savory, almost mushroom-y funk to it that sort of copied the food, but also showed off counterbalancing sweet, floral notes. 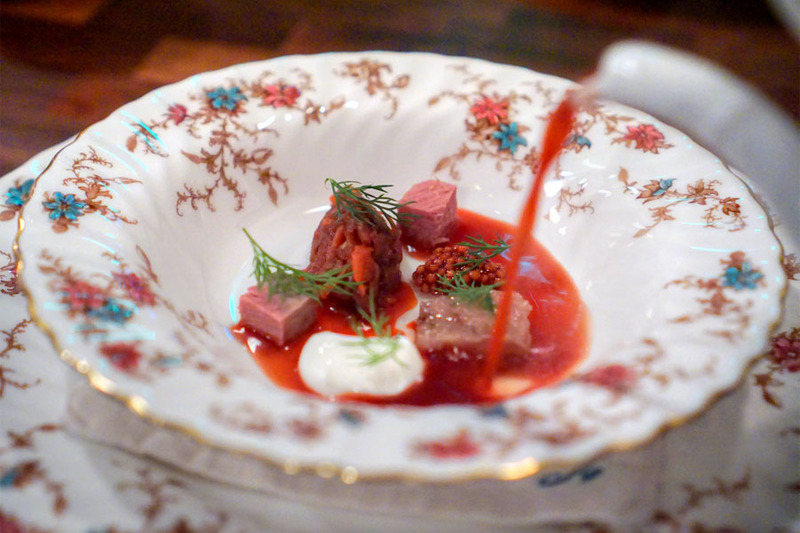 This next course was also a table favorite. 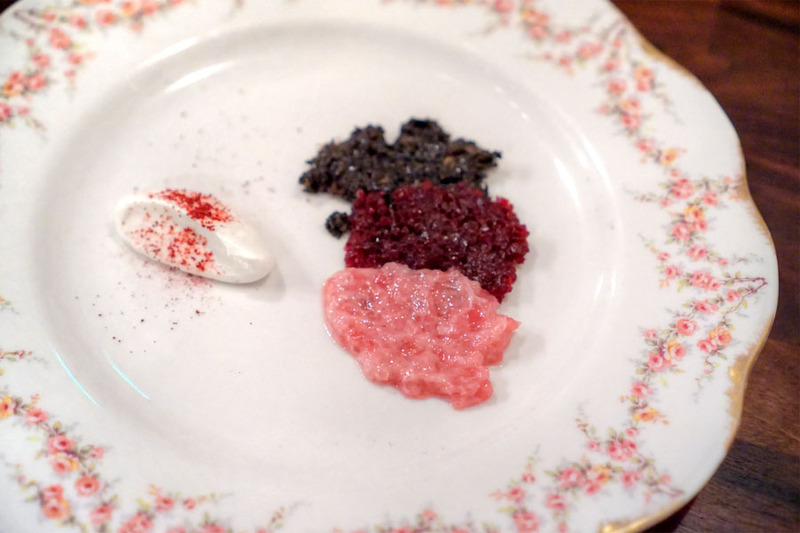 We had gelatinous, barely-cooked trout atop a stinging nettle yogurt, with wild greens and smoked and beet juice-cured trout roe. 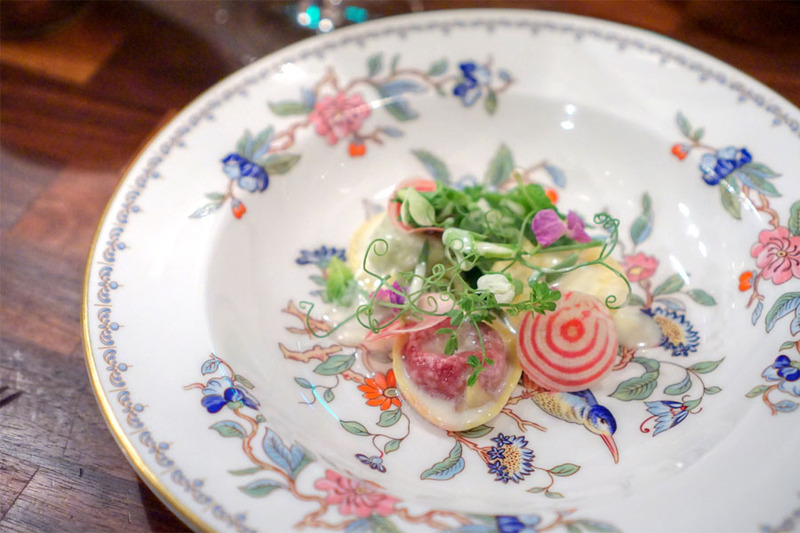 The delicately-flavored fish meshed flawlessly with the zippiness of the yogurt, and I loved the contrast between the salty pops of the roe and the brightness of the greens. Overall, one of the best preparations of trout I'd ever had. 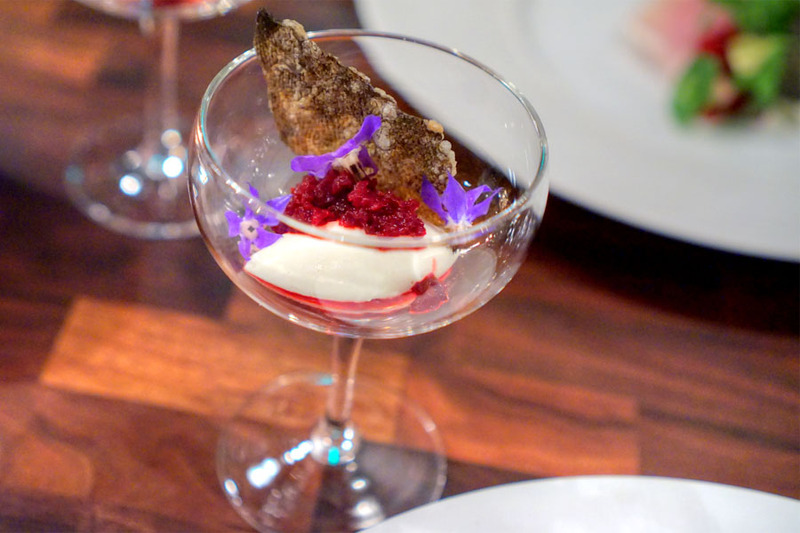 If that wasn't enough, an accompanying goblet held a smoked trout mousse with beets and crispy trout skin. This was excellent as well, the smokiness of the mousse having a great back-and-forth with the sweet beet while the skin added a hit of salt. As for the paired Grüner, I found it savory and nearly nutty on the nose. Interestingly, the palate was much more vivid, delivering sweet, vibrant nuances of tropical fruit that certainly made sense with the fish. 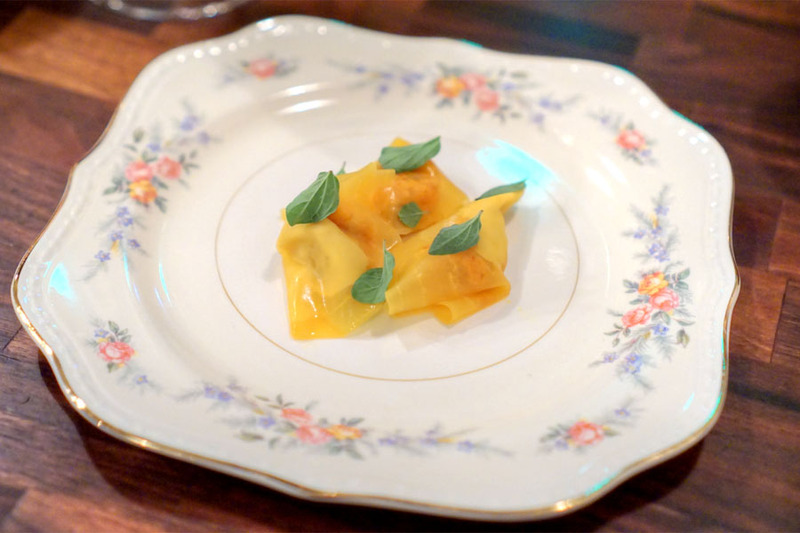 Our pasta course comprised three types of ravioli: one featuring creamy, true-to-life flavors of beet; one with tangy, lactic goat butter; and one highlighting peas, mint, and tarragon. The paired rosé worked, delivering refreshing berry fruit along with plenty of tartness and acidity. 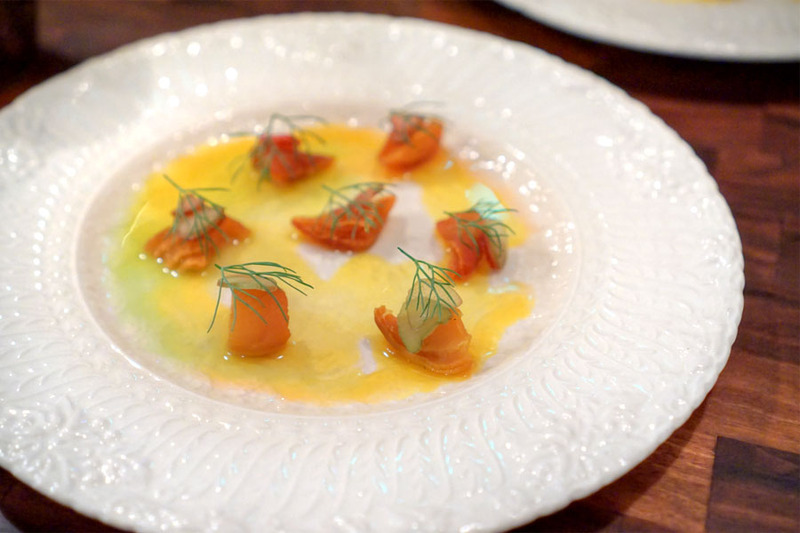 'Nduja from Gwen was served with a Marcona almond purée, then draped in saffron-compressed beets and topped with oregano. It was an exercise in balance, the balance between the salty heat of the sausage spread, the nutty mash, and the comparatively light, crisp beet, with the oregano serving as an herby accent piece. The almond was sort of mimicked with the wine pairing, the Madeira displaying nutty, oxidative characteristics along with dark fruit on the back end. 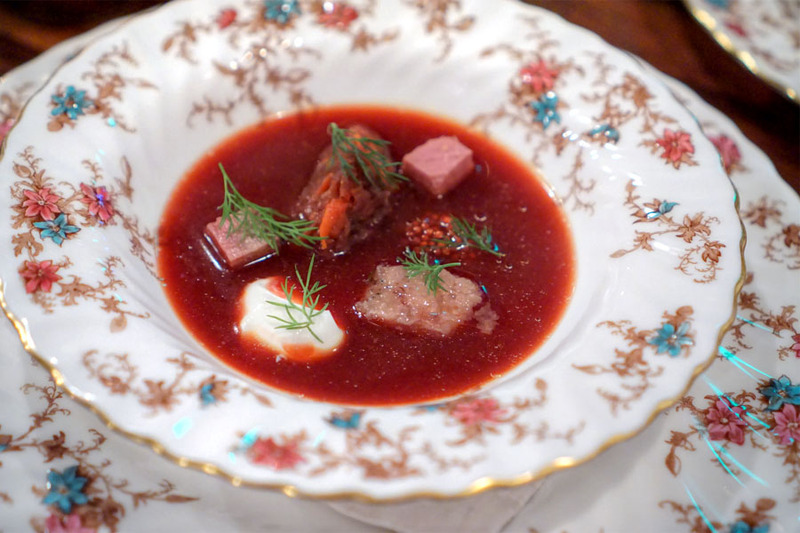 Given the month's theme ingredient, I expected a take on borscht, and what we had was pretty traditional in essence. The focus here was the overarching tartness of the soup, which was further enhanced by the pickled mustard seeds and smetana. Marrow and soft cubes of brisket provided a heartiness to the course, and I much appreciated the aromatics imparted by the dill. 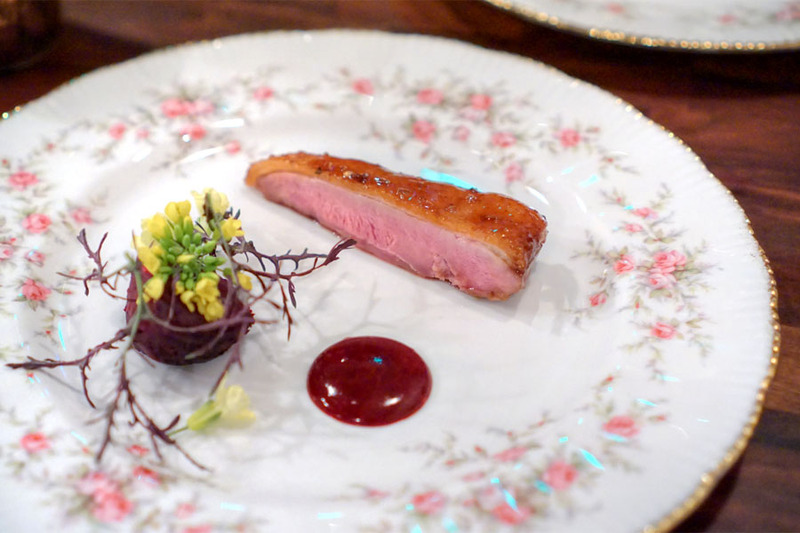 A sliver of duck breast came roasted and lacquered with a combination of honey, cumin, lavender, and coriander. It was pretty stellar: juicy and crisp-skinned, sporting super deep, ducky flavors with just a trace of sweetness. It was delicious alone, and even better with a dab of the beet mustard. Rounding things out was a charred beet with mustard greens. 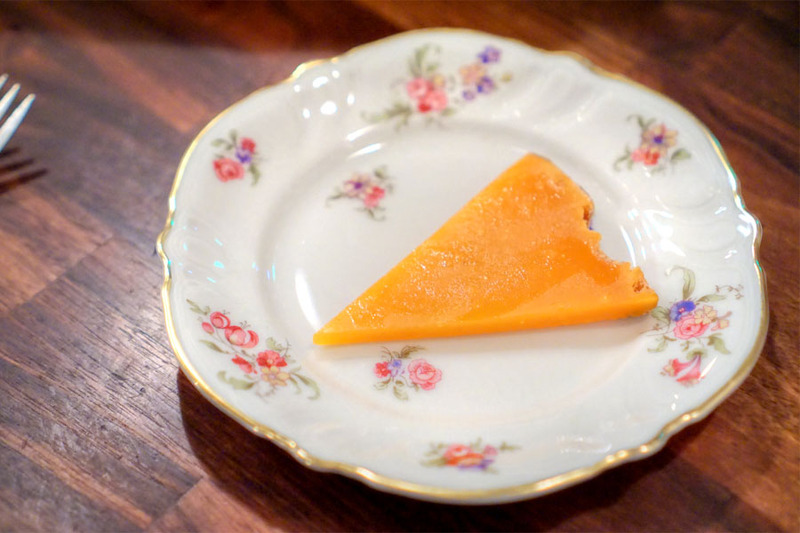 Fromage consisted of two-year-old Mimolette, a cow's milk cheese from France. I found it rustic, hard and gritty to the bite, with a salty, nutty, slightly sweet taste. 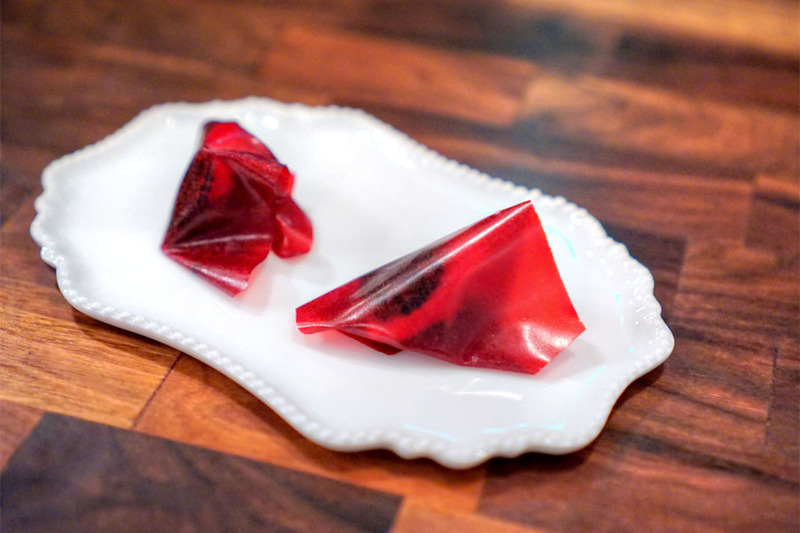 Accompaniments included crunchy beet beer crackers paired with a fruity beet fudge. 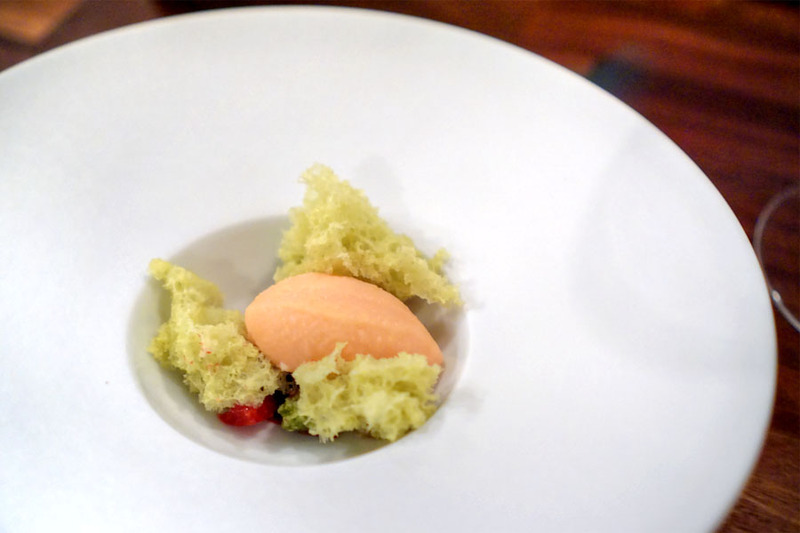 Pre-dessert duties were handled by a super concentrated blood orange sherbet, one that meshed well with nutty fragments of pistachio cake and bits of sugary beet below. 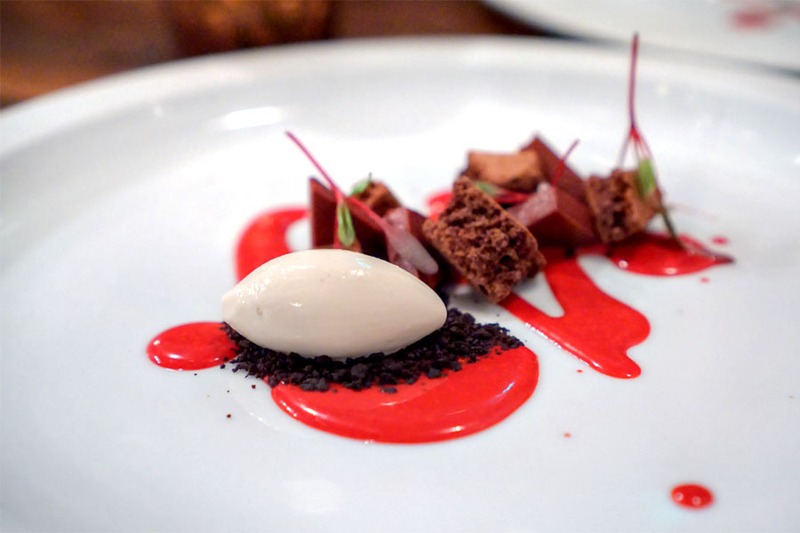 For dessert proper, a tart rose hip frozen yogurt served as a cool counterpoint to the sweeter dispositions of beet and crunchy chocolate shards. I appreciated the touch of herbiness from the microgreens here, too. 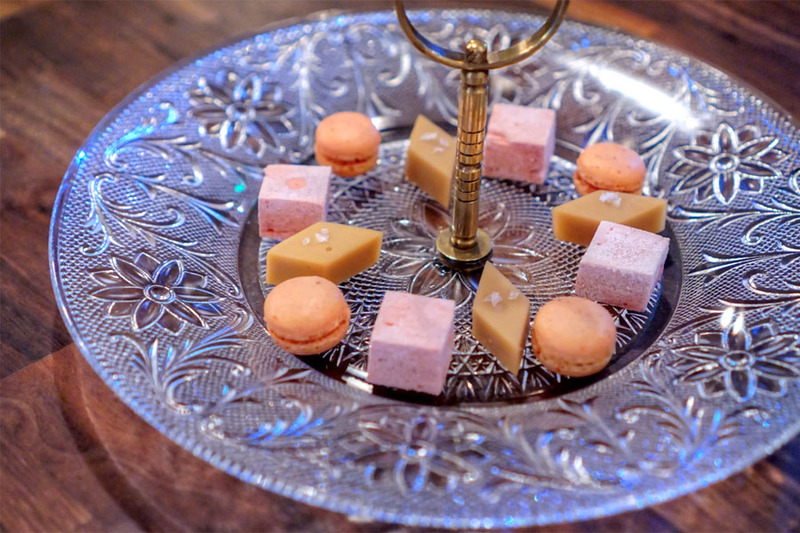 A trio of mignardises included beet marshmallows, golden beet and miso caramels, and beet and juniper macarons. 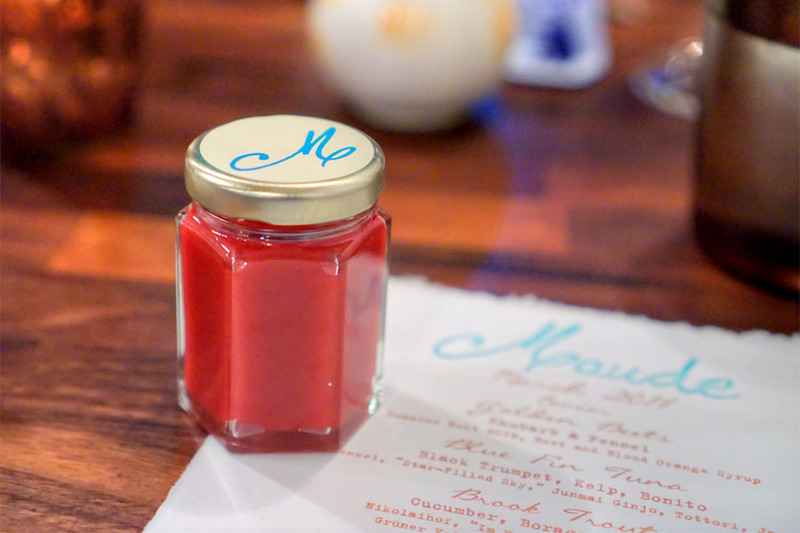 To take away: a jar of the beet fudge that we enjoyed with the cheese course. All disparagement of the theme ingredient aside, I expected this to be a strong meal, and it was, but it turned out even better than anticipated. The beet was used in a lot of different ways here, but never did I feel that it was domineering, which is often my grievance with the root veggie. I'd actually say that this was one of my strongest meals at Maude yet, so hats off to the kitchen for that. Definitely not worth the price of the meal. Really? It's $12.50 a course if you don't get the wine pairing. You can't even buy or find some of those ingredients yourself and if you did, you'd end up spending days to do so. I want to try this restaurant so bad! Thanks for the great review, Kevin! 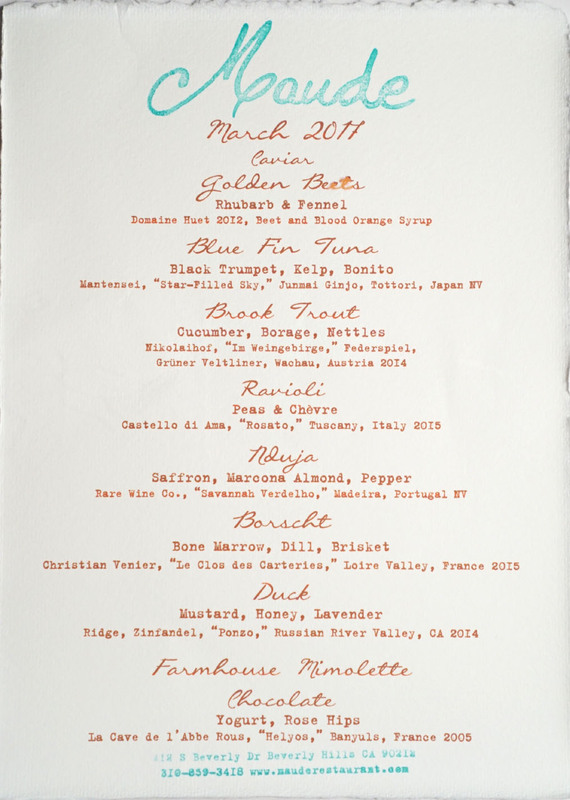 Do you think they will keep the menu at the same price on November and December for truffles tasting menu? Sometimes it is good to be here on this article and i was hoping for this info and then i have got many things from this article.Thanks for share this info and i wish for more updates.You have great ideas to share something fresh here.You did such a great job.